**Editor’s note: This reply did not contain a body, only accompanying documents (see at top left). Thank you very much with your assistance with this request. Attached please find a list generated to provide information you recently requested from the North Carolina State Board of Elections and Ethics Enforcement office. Thank you again for your assistance with this request. I’ve noted that the files related to Candidate Filing are available at the link you’ve provided, but they only display information for 2015, 2016, 2017, and also do not include addresses. I’d like to clarify once again that the requester is asking for access to the candidate_list.txt file that was removed from SBOE’s site after 2006. This file included the address of the candidate who filed. 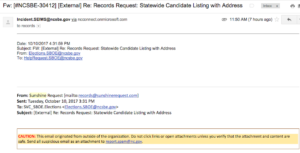 They would like to request access to this information and it should include the date range back to 2010 for every candidate filing for office in North Carolina, and should be formatted in the style made available by NCSCBE at https://s3.amazonaws.com/dl.ncsbe.gov/ENRS/layout_candidate_list.txt. Please let me know whether this is possible, and if you have any additional questions. Please refer to original request (below). These data are public information so persons may access any of the directories. I do not believe that this information fully satisfies the request – The sender indicated that they would like “to request this file for the past 7 years for every candidate filing for office in North Carolina.” At the link you’ve provided the only information available is for 2017. If there is some other way that they can access this information, please let me know. I believe our website has the information that you are looking for. Please go to our website at www.ncsbe.gov under elections and you will see “ 2017 candidate filing list”. Following up here – Please let me know whether you have an update or any questions about this request. Also, can you please confirm receipt of my previous email so that I may update our site www.sunshinerequest.com to indicate that the request is being “processed by government”? We received a new request for information that we believe may be available at your office, via SunshineRequest.com! Could you please assist me with completing this request, or point me in the direction of the appropriate party to contact?